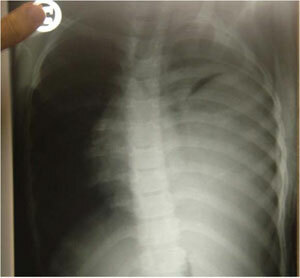 She was the fourth child in the family from a mother G5P5Ab0 and the result of a NVD without complication. She was from afganistan and had a long contact with a patient with TB , she lived near a sheep raising, no history of hospital admission , or specific illness, vaccination history was positive. General appearance was good . 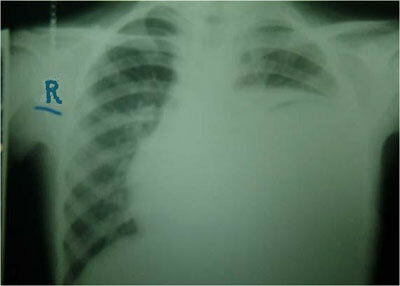 chest = heart sounds were normal, full dullness on left lower chest and decrease of the breath sounds was apparent . 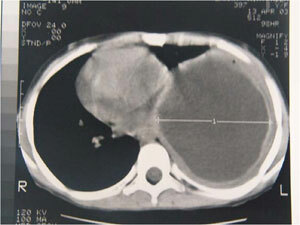 Homogenous opacity on left lower lobe that obscures the diaphragm and causes the shift of trachea and heart to the right ,a crecentric shadow is seen at the top of the opacity that suggests its CYSTIC NATURE, CTscan of thorax was recommended . 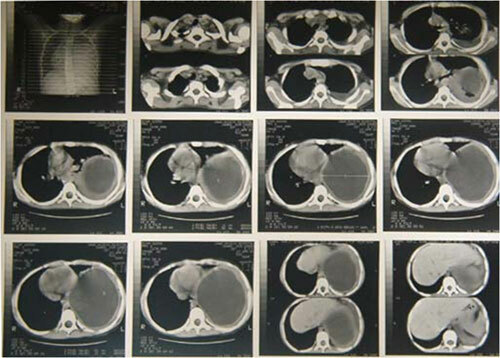 In the posterior left hemi thorax there was a big cystic mass with thick layer and pleural thickness , it seems it is an encapsulated empyema.